Want a little levity in your day? 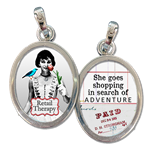 These charms are sure to bring a chuckle. Feeling queenly, brave, sassy, or just downright fabulous? You're sure to find one that fits who you are at any given moment.